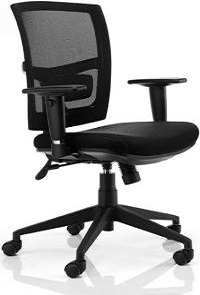 The Buro Brio is a modern style chair with a mesh back that allows ventilation and excellent back support. Indicative maximum user weight 120kg. Indicative total sitting hours per day upto 8 hours. Height and depth adjustable lumbar. High density quality seat foam. Seat and back tilt with lock adjustment.